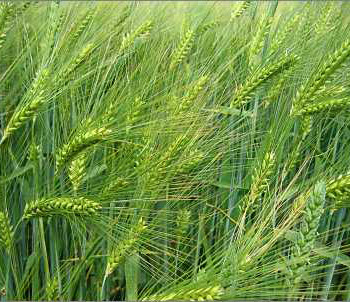 Barley is an annual plant; its stout, simple stem (culm) is hollow and jointed and grows from 1 1/2 to 3 feet high. The narrow, tapering leaves ascend the stem in 2 ranks, the third leaf over the first; and their bases form loose sheaths around the stem. The flowers grow in bristly-bearded terminal spikes, producing eventually the elliptic, furrowed barley grains. The leaves of barley are broader than many other grasses, but more characteristic still is the “bearded” look of the spikes, this being due to the long awns that grow from them. A field of ripe barley radiates a pale yellow light. Widely cultivated as a food grain. The major producing states are North Dakota, Minnesota, South Dakota and California in the United States. In Canada, Saskatchewan, Alberta, Ontario, and Manitoba. Used in manufacturing beer, malt beverages. 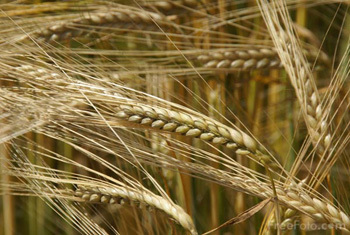 Barley seeds were found in tombs in Asia Minor dating from about 3500 BC. It is believed that barley had it origin in western Asia and was used for food for animals and man; was the chief grain for bread making in Europe until wheat and rye. The earliest settlers to North American brought barley to the continent. A mucilaginous substance is obtained when hulled barley (pearl barley) is cooked; good nutritional source for throat or stomach problems. 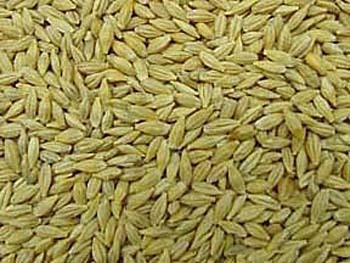 The demulcent properties of cooked barley is useful in external treatment of sores, fevers, diarrhea, gout, and tumors. Used as a tonic during convalescence. Barley water is a skin freshener, cleanses and softens skin. Made by simmering 3 tbsp. barley in 3 cups water for an hour. Strain and cool. Rinse off face after using and refrigerate the barley water. This is best for normal skin. Drinking barley water is also supposed to clear and beautify the skin; sweeten with honey and orange juice. Barley shoots are used to dry mother’s milk, treat food stagnation, weak stomach, weak digestion, loss of appetite, and hepatitis. Decoction: was 2 oz. barley with cold water and boil in 1 cup water for a few minutes. Discard the water and boil the barley in 4 pints of water until the total volume is 2 pints. Strain and use as required. Barley water: wash pearl barley in cold water. Boil 1 part pearl barley in 9 parts water for 20 minutes and strain. A dose is from 1 to 4 oz. Should be avoided by nursing mothers. LiveStrong.com: What Are the Benefits of Barley Grass Juice? PubMed.gov: Consumption of barley beta-glucan ameliorates fatty liver and insulin resistance in mice fed a high-fat diet. PubMed.gov: ß-glucan from barley and its lipid-lowering capacity: a meta-analysis of randomized, controlled trials. Chinese Medicinal Herbs , compiled by Shih-Chen Li, Georgetown Press, San Francisco, California, 1973.